We always teach our clients to not only blog but to also syndicate each blog post in an effort to reach more readers. Although they all take notes and write down the URLs, a couple asked us to create a cheatsheet for them. And I also created the below video to demonstrate each step so you know what each site looks like and how to navigate through the site to get the best results. Below the video is the cheatsheet. And, if you'd also like to receive our ready-made pdf, please enter your name and email address in the form below the list and it'll be sent right out to you! Update any required plug ins as per the notifications at the top of your wordpress screen. Review Tags (5 – 7). Set Featured Image with Call to Action in the description. Edit post as needed for style. Repeat steps 7 – 10 as needed until you’re happy with the post. Capture the image of your blog post on your smartphone and share on Instagram. 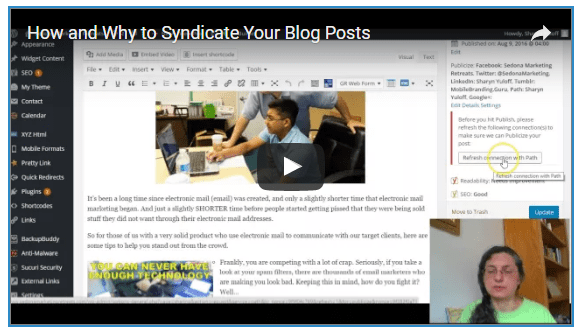 Congratulations, you have now syndicated your blog post! please click this link to schedule a free 20 minute strategy session or just call us at 800.705.4265. We look forward to helping you in every way we can!